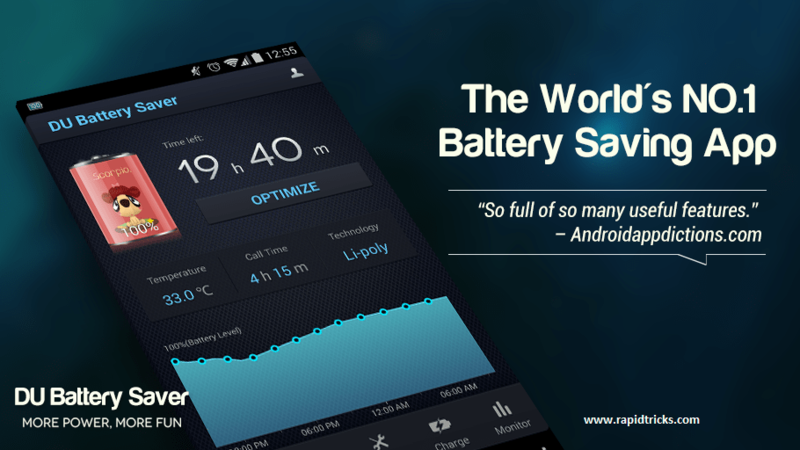 DU Battery saver pro is the most successful and most using battery saver for Android devices Around the world. its Pro features makes it more powerful battery saving application, it makes your battery last longer. when you install DU Battery Saver Pro & Widgets, you will notice excellent improve in your phone’s Battery life. The app is Developed by DU App Studio, you can easily optimize your phone’s Performance by just tapping the “Optimize” button. while optimization, it clears all background application which eats your phone’s Battery Life. You don’t need to install any further app to optimize your Smart phone’s performance, DU Battery Saver Pro & Widgets gives you awesome user experience. it also provides you widgets, which you can set on your Phone’s Desktop to use these instantly and make your phone even more faster. So today we are brought to you “DU Battery Saver Pro & Widgets“, Let’s Talk About it’s Features. Simply it’s safe your battery life. Different modes for saving battery and optimizing performance. Clear All background apps with one touch. Widgets for instant feature access. Delete temporary files & Cache. Make Schedules for battery Saving. Different Widgets in Notification Bar. CPU Frequency (Rooted Devices Only). choose which apps you want to prevent from Auto clearing. Auto Clear Applications: automatically close the background apps which drains your battery life. Auto Clear Schedule: you can set an auto clear Schedule for clearing cache,background apps and temp files on your phone. Clear background apps without unlocking your phone. Battery Level: switch to any mode you want when battery level reaches to an specific level. Protect your choosen apps from auto clearing. Please Support us By like and Share this post.